Mechanical springs are mechanisms that exert force by compressing, rotating extending, pulling or sliding. They include a wide a range of wire forms including extension springs, torsion springs, rectangular springs, compression springs and more. Wire springs are produced in a range of configurations, thicknesses, and sizes and are used in everything from small household tools and appliances to heavy machinery. Wire springs are typically made using two methods: coiled wire or metal stamping. To create coiled springs, stock wire is fed into a machine or place on a lathe that forces the wire into the desired shape. Additional coatings or finishes may also be applied for aesthetics or to create a protective coating. Another method is metal stamping, which is a process where dies and hydraulic presses are used to cast, punch and shape high volumes of molded forms from flat sheets of metal. Custom metal stampings are used in household appliances, electronics, automotive parts, HVAC components, and heavy machinery. RC Fasteners & Components is your number one source for top quality springs, wire forms, and metal stampings. We maintain a huge inventory of stock springs, including compression springs, extension springs, tapered springs, torsion springs, rectangular springs, and more. Or, if none of our off the shelf options are right for your project, we also offer custom springs made to your specifications. Compression springs are wire forms that provide the highest amount of potential energy when they are compressed and release energy as they return to their natural position. They are typically manufactured in helical spring, tapered spring or rectangular spring shapes and vary in size and thickness. Helical springs, also known as coils springs, are made from round wire and have a standard coiled shape. They are highly versatile and used for a wide range of applications. Tapered springs have a conical shape with a wide base and a narrow top. They collapse into themselves when compressed and provide more stability than other types of mechanical springs. Rectangular springs have an oval shape and are made from rectangular wire. They are typically used in applications where space is limited and can store more energy than springs made from round wire. 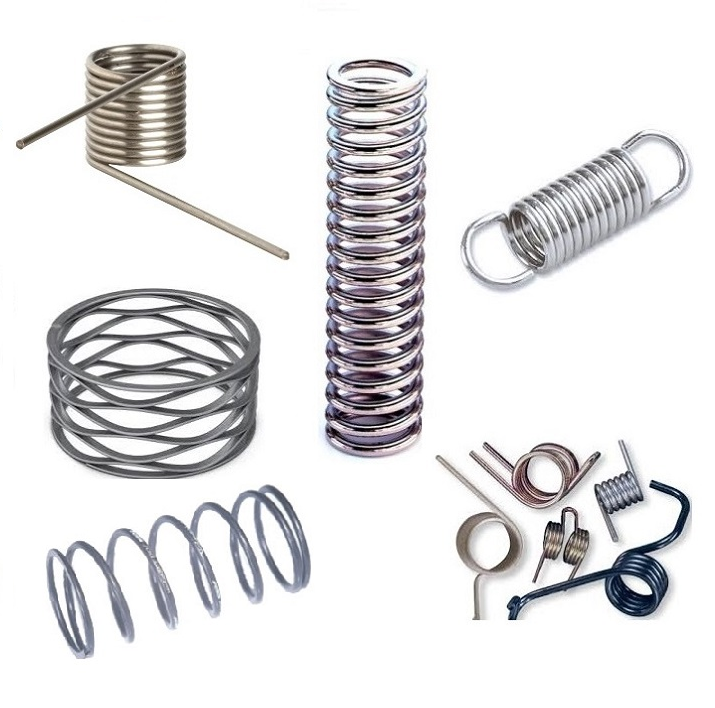 Extension springs, also known as tension springs, are cylindrical wire forms with a tighter coil than compression springs and are sometimes manufactured with loop, eye or hook at both ends for mounting. They produce the highest amount of potential energy when extended and then release the energy when returned to a compressed position. Custom extension springs can store and absorb energy and are used for applications where pulling force is required. Torsion springs are helical wire forms that exert force in the opposite direction when they are twisted. They produce both torsional and rotational forces and can be wound either clockwise or counter-clockwise. When a torsion spring is twisted, it stores mechanical energy that is then released when the wire spring returns to its natural position. Metal stampings are flat springs and fasteners created from thin sheets of metal. Because dies are used, they can be bent and formed into a wide range of shapes and sizes and are suitable for high volume production runs. At RC Fasteners & Components, our lead times are great, and our pricing is even better. It may seem like ordering directly from the manufacturer would give you the best possible pricing, but that’s not always the case. The relationships we’ve built over the past decades have enabled us to be extremely competitive on all types of springs, custom springs, and stampings. We offer the best products at the best prices you’ll find anywhere. We not only provide superior products, we back them up with superior customer service. If you’re not sure which spring or wire form you need, our knowledgeable staff will work with you to determine the best product for your application. If you need standard or custom-made springs, look no further than RC Fasteners & Components. Contact or request a quote from one of our RC Certified Fastener Specialists to see how we can save you money on all your custom mechanical springs and fasteners.